We finally made it to the co-op, so there should be a whole bunch of new reviews heading your way over the next couple months. Hooray! First from the new bunch, Lightlife Organic Smoky Tempeh Strips. On the package, it also says "Fakin' Bacon" so I went ahead and planned on using it like bacon. I was making some twice-baked potatoes for dinner that evening, and thought some fake bacon crumbled on top would make a lovely addition. While baking the potatoes, I started frying up the tempeh strips. 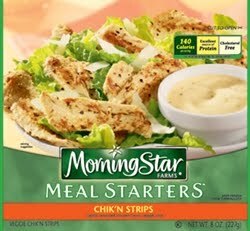 The directions say to fry the strips in a moderate amount of oil until edges are crispy. No indication of how long that might take, so I had to wing it. No problem. I fried them for a while, flipping them over occasionally. Eventually, the edges started to get a little darker (maybe 8-10 minutes?) but didn't seem crispy. I thought maybe it would be like bacon where it doesn't get crispy until you drain off some of the fat, so I laid out most of the strips on a couple layers of paper towel. I kept the rest of the strips in the pan to see if they would ever get crispy. I think they were on the heat for an additional 10-15 minutes, and finally started to blacken a bit. I pulled them out and laid them on the paper towel where they crisped up nicely. I broke (tore, really) off a piece of the non-crispy strip and tasted it. It definitely had a smoky flavor, but it was nothing like bacon. The texture was kind of… wet-cardboard-y? Not terribly pleasant. Then I broke off a piece of the burned-yet-crispy strips and tried that. Still smoky-tasting, of course, but the texture was much improved. The crispiness is really important for this product. Be sure to be patient with it, if you plan on trying this out yourself. I'm not sure burning it is the answer - there was probably a point between the first batch and the second batch where it would still crisp up without being burnt. I crumbled up the crispy pieces and scattered them on my cheesy, creamy, twice-baked potatoes. Man, I make good potatoes. Anyway - the smokiness and crunchiness were a nice addition to the potato. I would not say it was like using bacon, however. I kind of wish that Lightlife hadn't printed "Fakin' Bacon" on the package. It really sets the consumer up for disappointment. 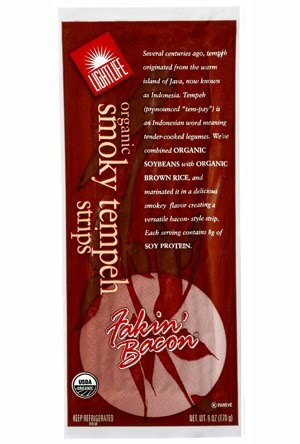 If they had stopped at "Organic Smoky Tempeh Strips" I think I could have given it a better grade. But no, they had to play the bacon card. Texture - soggy if undercooked; crunchy, almost crumbly when burned - probably a happy medium in there. I'll have to try these again sometime to see if I can find it. Flavor - smoky, yes. bacon? no way. Check out the link in the upper-right of the page that says "Grading Chart" - that's a nice compilation of all the reviews I've done, whether the products were vegan or not, and what grade they received, so you can quickly see what I've reviewed. This will also come in handy as a nice printable list we can take to the store to make sure we don't buy things we've already tested. I added a new tag this morning. It occurred to me that some people might want a vegan tag, to quickly sort out things that have milk or egg in them. The way I figured out whether something was vegan or not was to look at the product website and check out their product info. My method: I first looked at the allergen information. If an item said it contained milk or egg, obviously it's not vegan, and it didn't get the tag. However, if it did not say either of these, I quickly scanned the ingredients for anything obvious. I do not know all the "vegan pitfall" ingredients (as I'm now calling them), but if there wasn't anything obvious, I marked it vegan. I was kind of excited to find several items with a little badge saying "certified vegan" and went ahead and labeled all of those as vegan, even though I have no idea who goes around certifying things as vegan. If you have other information about any of the products I've tagged, let me know and I'll remove the tag for anything incorrectly labeled vegan. I cannot promise that the company will not ever change their ingredients to make something not vegan. If they change things and I don't notice (which I likely won't), let me know, and I'll fix my labels. Basically, what I'm saying is that I am not a vegan - make sure to do your own research before diving into anything. I had seen a lovely-looking soup recipe on the internet that called for Italian sausage, so I figured this would be perfect, even though it wasn't specifically labeled "Italian" - I knew the nice spiciness would meld with the rest of the ingredients. I heated the oil, and threw in the sausage crumbles, letting them brown a little in the pot so I'd get some nice bits stuck to the bottom (that's called fond by the way, and it's magical) to mix in with the rest of the soup. Then the recipe said to remove the meat while doing the next parts, so I did. This also gave me a chance to try the cooked crumbles before mixing them with everything else. They were pretty tasty. A little spicy, a little sweet, nicely chewy. I was feeling very confident about the rest of this meal. One side note, the package suggests forming the fake sausage into patties and frying them up for a breakfast sausage application. Not sure whether I was just in dinner mode or not, but the flavor didn't exactly scream breakfast food. Maybe I'll try it again sometime as a breakfast protein and see if it works. Back to dinner - I finished up the soup, making sure the flavors had time to meld beautifully and the kale was done cooking, seasoned to taste (gotta have enough salt, or it just tastes blah), and dug in. I had hoped to have some nice crunchy bread to go with it, but the bread was taking too long because I didn't start it soon enough. Oops. This would have been awesome with bread. Keep that in mind if you try it yourself. Even without that, it was truly delicious. The fake meat sausage played very well with the rest of the ingredients. I'd eat this again. Flavor - Deliciously seasoned, slightly spicy, slightly sweet. Preheat the oven to 350˚F. Cut the top off the heads of garlic to expose the cloves within. Place the garlic in the center of a piece of aluminum foil, drizzle with the olive oil (probably just a teaspoon or so on each head, but you want to cover the surface) and seal the foil tightly. Roast for 40 to 45 minutes, or until golden brown. Let cool to room temperature, then peel. In a food processor (or blender), combine a cup of the broth (two or three cups if using a blender), all of the white beans, and the roasted garlic, and process until smooth, adding additional broth if it is too thick to process. Once smooth, set aside. Add 2 tablespoons of oil to a large, heavy pot and swirl to coat the bottom. Heat over medium-high heat until hot and shimmery. Add the sausage and cook for 5 to 6 minutes, tossing about 3 times, until brown in spots. Using a slotted spoon, remove the sausage to a plate and set aside. Add the wine (or water) to the pot and simmer for 2 to 3 minutes, scraping up the brown bits from the bottom of the pan with a heat-proof spatula. Add in the white bean mixture with any broth not currently in the white bean mixture, return to the heat and bring to a boil. Return the sausage to the pot, add the kale and tomatoes, and simmer, stirring occasionally, for 10 to 12 minutes, or until the kale is tender and flavors have melded. Season to taste with salt and pepper. Ladle into bowls and serve immediately. Sorry, no new review this week... my brother just graduated from college, so I've been busy driving all over Minnesota and haven't had time to eat any fake meat. I'm done with culinary school now (yesterday was my last day! ), so at least for a while I should have lots of free time. I've got my next review all planned out - got a recipe picked out to go with it and everything. It's going to be awesome! I hope.